A refined collection of 20 spacious 2 and 3 bedroom homes are available at The Kirkland Vancouver. Blending traditionally stately and classic urban elegance, the homes are steps from prestigious Kerrisdale and complements the historic West Side Vancouver neighbourhood. 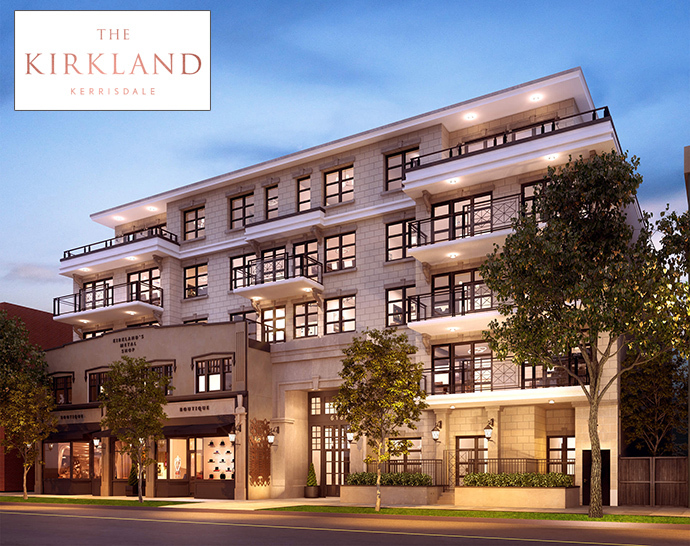 The Kirkland Vancouver will be a Kerrisdale landmark as this masterfully designed 5 storey concrete residential building will be located in the established West Side neighbourhood that has an authentic and established village charm. The twenty residences at The Kirkland Kerrsidale will all be two or three bedrooms and they are being built on the site of the historic Kirkland Metal Shop from the 1920’s. The solid concrete construction will stand the test of time and the solid core interior doors will welcome you home. The homes will include 2 secured underground parking spots and there will also be a secured bike storage locker. 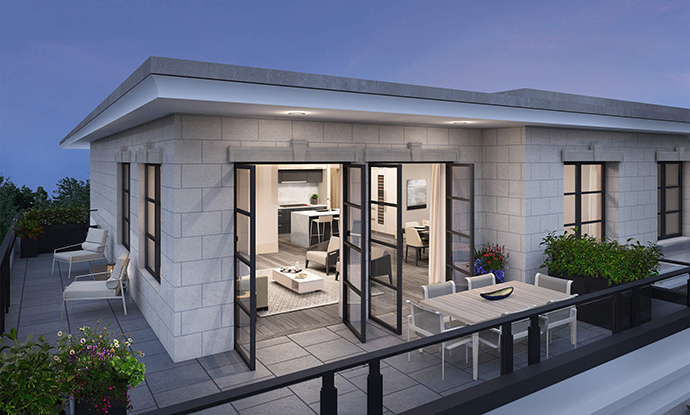 The Kirkland Vancouver luxury condos in Kerrisdale will also feature keyless entry into the building and parkade and floor restricted access. All homes are pre-wired for security alarm system and are also hard wired with smoke detectors and fire sprinklers. All homebuyers will receive the comprehensive 2-5-10 warranty by Travelers Insurance Company. With over 45 years of experience, The Kirkland Vancouver West Side condos are brought to you by The Bogner Group. The interior design is by award winning firm Area3 Design Group and the architect is Rositch Hemphill Architects. The Kirkland Condo Presentation Centre is located at 6178 East Boulevard Vancouver and they are open daily (except Fridays) between 12 noon and 5pm. For more details, you can visit www.thekirkland.ca or you can register your interest on the top of this page for more details including The Kirkland Kerrisdale condo availability and pricing. 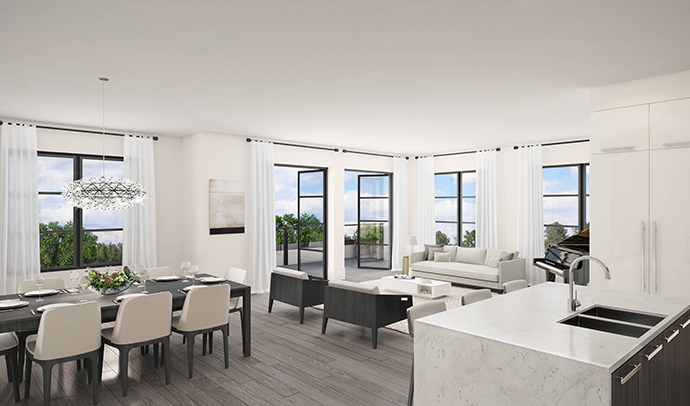 The Kirkland condos in Kerrisdale will feature two colour schemes professionally chosen by Area 3 Design Studio that are called Champagne and Truffle. Here are some of the interior features of note: over height smooth finish ceilings, rich engineered hardwood floors in main living areas and bedrooms. There is a grand entry cove with ceiling details and feature lighting in addition to spacious outdoor balconies (some with extra large terrace decks). The presale Vancouver Kirkland condos also come with a true laundry home in most floor plans with quartz counters, upper cabinetry storage and of course, side-by-side washer and dryer. The homes are individually controlled with heating and air conditioning units in addition to master bedrooms with walk in closets that include custom designed organizers and signature lighting. All homes come with contemporary roller shades and a thoughtful detail that includes a USB outlet in the master bedroom and the kitchen. The lavish master ensuites at The Kirkland Vancouver luxury West Side condos includes contemporary wood veneer floating vanity with under cabinet LED lighting with motion sensor, 24×24” porcelain floor tilework, luxurious free standing soack tub with marble tiled featured wall, frameless glass shower with Grohe rain shower and handheld DreamSpray unit, in floor heating and programmable towel warmer, wall mounted Duravit toilet with soft close seat in the ensuite and powder room and so much more. The elegant powder rooms come with 12×24” limestone feature wall tile, Blu-stone countertop basin, Grohe wall mounted faucet and LED under cabinetry lighting. 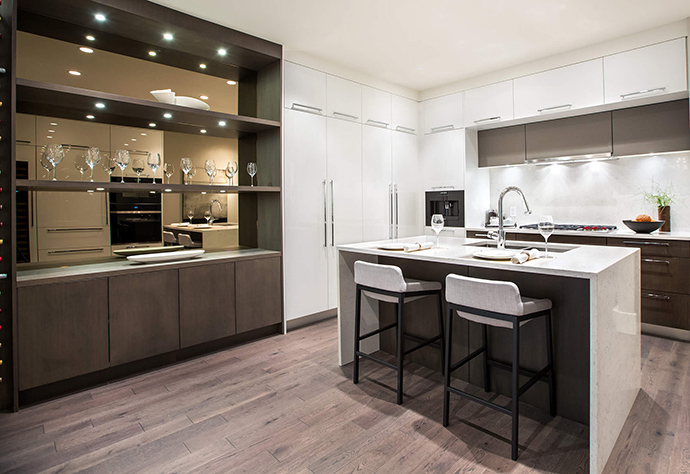 The kitchens at The Kirkland Vancouver Westside residences includes an integrated appliance set with Sub-Zero fridge, Asko dishwasher, slide out Faber hood fan, Wolf glass wall oven, Wolf gas cook top and Wolf glass microwave. Other kitchen features at the presale Vancouver Kirkland Kerrisdale condos includes a built in under sink tandem recycling station, stainless steel double basin sink with built in sink disposal, well designed pantry for lots of storage space, European inspired wood veneer cabinetry and polished quartz counters. Although the homes at The Kirkland Kerrisdale are already very high-end, the developer is giving presales homebuyers a list of optional upgrades ( at additional costs). One of these fabulous options is a seamlessly integrated built in Wolf coffee maker. Another is a full height integrated Sub-Zero wine fridge with independent cooling zones. 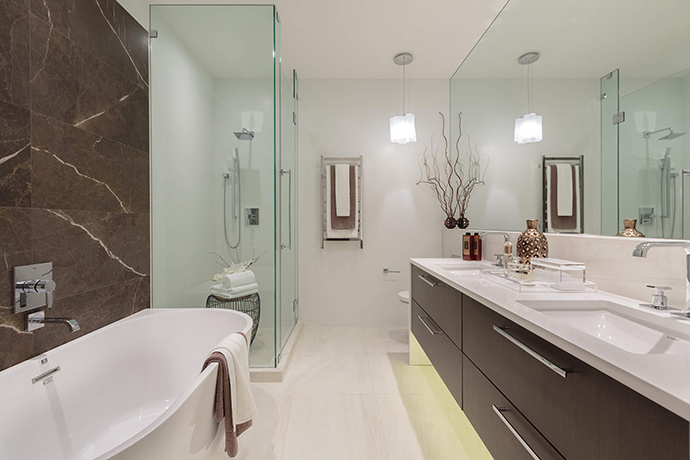 Other optional upgrades at The Kirkland Kerrisdale condos includes in floor heating in the main bathrooms as well as hand blown glass pendant in the powder room and master ensuite bathroom. Below is a small selection of the many 2 to 3 bedroom single-level floor plans featured at The Kirkland Vancouver West Side condos. There is also a ground level Kirkland “Townhome” which features 2 bedrooms and 2 bathrooms at 1,314 square feet and a large ground level patio at 200 square feet. You can visit www.thekirkland.ca for a look at all the layouts available at this prestigious development. Please note that the floor plans are subject to change at any time.